(L-R) Fox 8 hosts Wayne Dawson, Kristi Capel, Stefani Schaefer are joined by Akron Children’s clinical dietitian Lindsay Bailey. Good health is more than good luck. 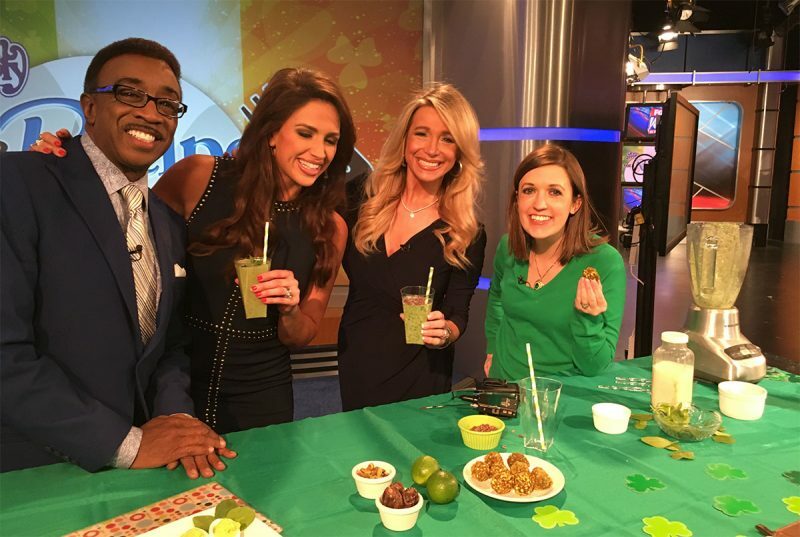 Lindsay Bailey, MS, RD/LD, a clinical dietitian with the Center for Diabetes and Endocrinology at Akron Children’s Hospital, shared some healthy alternatives for your St. Patrick’s Day celebrations during an appearance on the Fox8 Morning Show on March 12, 2018. The video of her appearance is posted below. Add all ingredients except oil to a food processor. Blend until starting to become smooth. Slowly stream in olive oil and blend until smooth. Enjoy with pita chips or fresh veggies. Slice shelled hard boiled eggs length-wise. Scoop out yolks and add to a bowl. Add 1 ripe avocado to egg yolks and mash until smooth. Add mixture to a piping bag or resealable bag with the corner cut. Pipe mixture into hard boiled egg halves. Enjoy! Blend all ingredients in a blender until smooth. Pour in a glass and top with cacao nibs. Enjoy! Add pistachios to a food processor and and process until fine. Reserve 1/2 cup of the nuts. Add dates to the food processor with nuts and blend 2-3 minutes or until ball forms. Break up ball and add lime juice and zest. Process until combined. Roll into balls and roll in crushed pistachio pieces. Refrigerate for up to 1 month in an airtight container.